Of course, by now we all know that “dull” opening set up the first real “whoa” moment of the show’s fifth and final season, but we’ll get to that later. For now, let’s consider that just before cutting to the title sequence, a train whistle could be heard in the background, foreshadowing the arrival of the episode’s all-important locomotive. 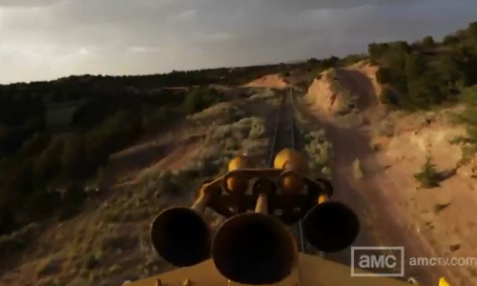 Not to mention that the scene included point of view shots of the dirt bike’s handlebars, later echoed by similar shots of the oncoming train just prior to the robbery (like the one seen above). That’s just damn good directing. And how crazy is it that “Breaking Bad” has so warped my mind that as soon as I saw that innocent child I was positive he would die or be the victim of some horrible fate? I know I’m not alone in that. When the commercial break ended, the first scene of the episode showed Walt strolling into DEA headquarters, ostensibly to discuss his marital troubles with Hank. Of course, the truth is that the man we knew as Walter White (you know, this guy) is all but dead. The criminal mastermind Heisenberg is now occupying his body, and it was he who took a page out of Gus Fring’s playbook by walking into the office of the very man hell-bent on finding him out. Mike may not be giving Heisenberg enough credit. Walt knew that if he shed a few fake tears, Hank would duck out to avoid the perceived awkwardness of a man displaying outward emotion. As soon as he’s out of the room, Walt’s pushing wires into Hank’s computer. Then, in another moment of foreshadowing, he’s still struggling to plant a bug behind a photograph as Hank’s walking through the doorway, completing the task just in time to make it look as if he’s studying the picture—a symbol of Hank’s “perfect” marriage—and yearning for better days with his own wife. Heisenberg is a man who refuses to let the unforeseen hiccups of reality disturb his perfectly thought out plans, whether that means planting the bug in the nick of time or refusing to stop the train robbery before he gets exactly the 1,000 gallons he set out to obtain. Ah yes, the 1,000 gallons of methylamine, that whole train robbery thing, let’s talk about that. We’ve heard the name Jesse James thrown around more than a few times this season. So when our favorite meth-making trio make the decision to rob a train, it’s almost expected. Almost. I mean, of course that’s what Heisenberg would do. After all, he fancies himself quite the criminal mastermind. He’s Don Vito, Jesse James, and a Nobel-level chemist all wrapped into one. He’s invincible, or so he thinks. Last week, he made it clear that nothing would stop the train that is their production and distribution of methamphetamine, and this week, we found out that meant not even literally stopping a train. Mike insists that there are only two kind of heists: “those where the guys get away with it, and those that leave witnesses.” Not wanting to kill two innocent men, he suggests switching back to cooking with pseudophedrine. Walt shuts that plan, and though he doesn’t come out and say it, we already know he isn’t afraid to sacrifice a life or seven. It’s Jesse who finds a way for them to have their cake and eat it too. Everything’s perfect. That is, until the Chekov’s Gun that is the boy from the cold open reappears, and Todd well, Todd follows orders. 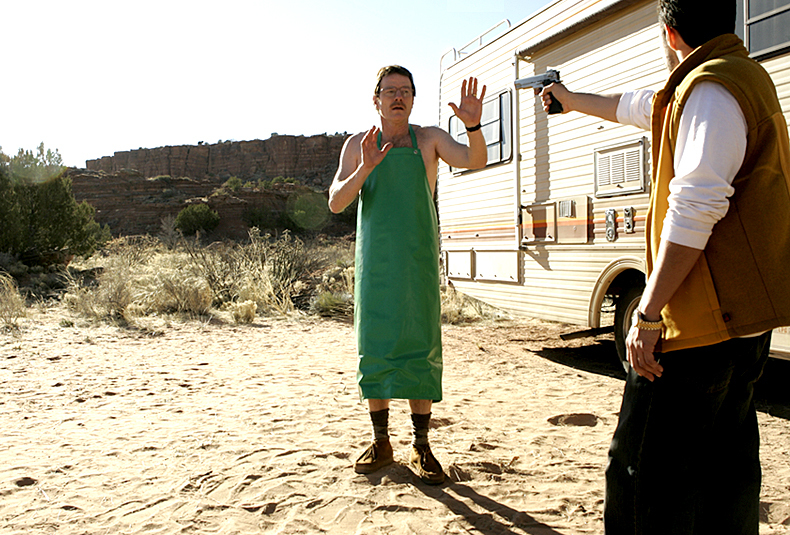 Recall what Jesse said when he explained the plan, “Boosting methylamine from a train is like a major rap. The point is no one other than us can ever know that this robbery went down. Nobody. You got it?” Todd responds in the affirmative, and when Walt asks if he’s sure, Todd responds “Yes sir.” And let’s not forget Mike’s orders when the insect guys first got involved in the meth game, speak only when spoken to and say only “yes sir” or ” no sir.” It seems Todd’s something of an upstart. He’s the guy who noticed and shut off the nanny cam the first time Walt and Jesse cooked inside a fumigated house. When that kid showed up, he probably thought he’d get a pat on the back for his quick thinking. That won’t be the case. Children have always been Jesse’s biggest weak spot. He freaked out when Gus had kids involved in street level dealing. He freaked out when he figured out that Walt poisoned Brock, although Walt convinced him otherwise, because “everybody sounds like Meryl Streep with a gun to their head.” And now, Todd’s gone and shot an innocent child who just so happened to witness the gang celebrating a successful robbery. Oh, and it’s no coincidence that innocent child bore a striking resemblance to Jesse’s younger brother. Watch the cast and crew go inside “Dead Freight” below and follow the writer on Twitter @NateKreichman.